The burger’s arrival is met with a laughter of disbelief, looking over all its different parts – with a remorseful sense towards the paltry care this burger has braved, what else can one do to hide the tears but to take this as a mean joke with the ‘patty’ as the distasteful punch-line. Chunks of bargain masticable beef steak, with a contemptible meat taste that’ll have you picking at your teeth and constantly re-stuffing the burger, doused in a spoonful of what can be described as a semi-icky canned gravy should by no means be accepted as a burger patty; this could perhaps be considered a steak sandwich, but a burger this is not – having a well formed patty is equally as important as having an appurtenant hamburger bun. The burger’s burger taste balance is not deplorably repulsive; this thing, this steak sandwich in burger’s clothing, has a better taste than one might expect considering its appearance – that’s not to say it’s a good one, as a realization sets in that most ingredients seem to originate from an un-fresh factory genesis of pre-packaged foods. Notwithstanding the ‘burger’ can still be finished, but it never quite feels like one is trustfully eating a hamburger. The bun is perhaps the more enjoyable of the bunch, soft and chewy-spongey, it compresses around the chunks of meat desperately gripping everything inside for as long as its physicality will allow it. The cheese appears to exist in this burger not so much for its white mild savor, but more so because of its plasticesque composition that serves as a barrier, that deafens the gravity of having gravy in contact with bread for an extended period of time. The greens, both the tomato and the lettuce, seem passable for a burger though do feel overloaded. The fries are alright. The Beef Burger with Cheese from Holly Brown is not worth the 72.00 HKD one has to wage for it. 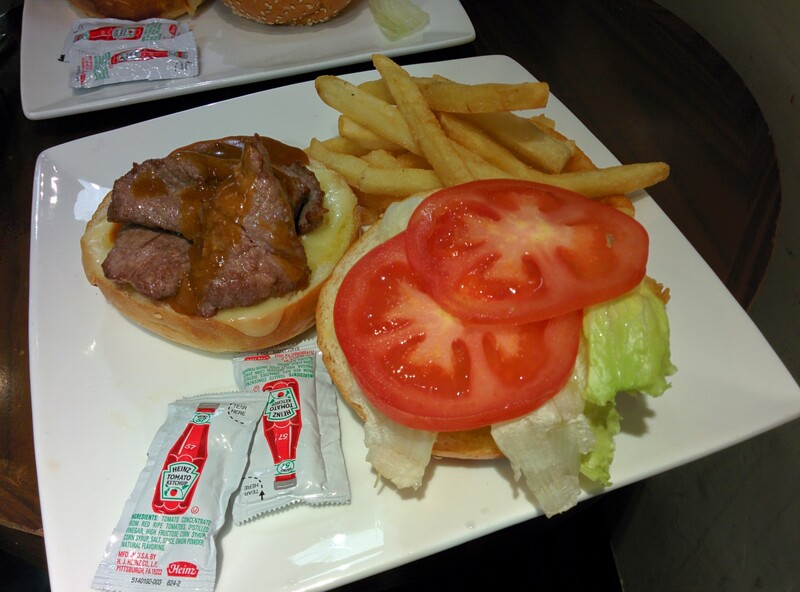 One could commend on the creative liberty that has been taken with this hamburger… but really no.